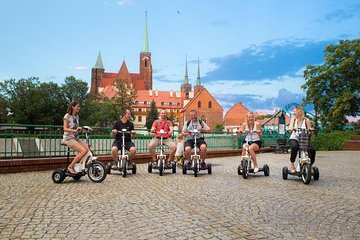 Discover the many attractions of Wroclaw with ease on a 2.5-hour electric scooter tour. The easy to ride 3-wheel scooter is perfect for travelers with limited mobility or anyone who needs a break from walking. See iconic attractions including Cathedral Island and the university, along with charming landmarks such as the synagogue and Wolnosci Square. As you cruise along, enjoy live commentary through a provided headset.